The world’s first solar-rechargeable tuner is the TC-1S from Tascam. 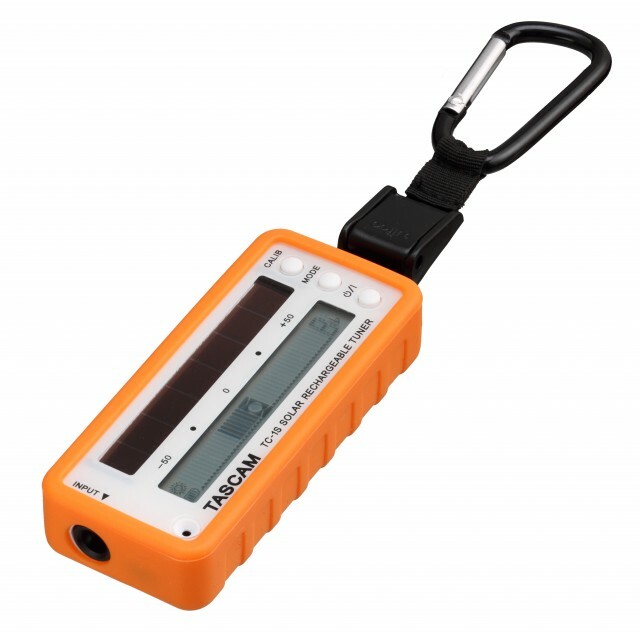 The world’s first solar-rechargeable tuner is the TC-1S from Tascam. The TC-1S charges its battery from a bank of solar cells on the front panel in just 25 minutes, and a USB input is also available for quick-charging. From a full charge, the battery works for six hours of constant use and seven years of standby charge in a dark place. It’s wrapped in a shock-proof silicone cover that keeps the unit protected. The TC-1S has a built-in microphone as well as a 1/4″ input for guitar and bass tuning. Its lightning-fast pitch detection is displayed on a wide bar graph display for instant feedback. Four display modes are available, including fine pitch display for 1-cent accuracy and strobe tuning animation. The tuner can be calibrated to an external source such as a piano or other hard-to-tune instrument. Included with the TC-1S is a nylon strap and clip. Snap it to your guitar or bass gig bag and it will stay charged all the time. Be the first to review “Tascam TC-1S Solar Tuner Orange” Click here to cancel reply.